Visiting Angels Operations Directors travel the United States to meet face-to-face with our elderly home care franchise owners and provide individual support. Regional group sessions with our home care franchise owners are also held throughout the year. Opening your own business is a monumental decision. Joining a franchise allows you to enjoy the benefits of being a business owner while taking advantage of the security that comes with franchise ownership. An elderly home care franchise from Visiting Angels will put you on the path to success. You'll be able to combine your own personal drive with the knowledge gained from almost 20 years of providing elderly home care franchise opportunities to grow your business and impact your local community. At Visiting Angels, we are committed to elderly home care franchise opportunities that provide the support for success. Our Operations Directors are always available when you need guidance or assistance. We believe in providing our home care franchise owners with face-to-face meetings so they can ask questions and gather information for the growth of their locations. 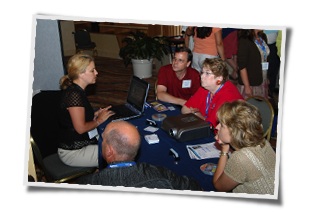 Held in convenient regional locations, our face-to-face meetings assist with the fine tuning of your home care franchise operations systems. Of course, we know that questions can’t always wait for a scheduled meeting. That’s why our Directors are always available via phone or email for immediate questions. Our highly skilled and experienced Directors have developed a support system designed to optimize long-term success. We are proud to have a team of Directors with many years of experience in the elderly home care industry. Our Directors have more than 75 years of combined experience providing at home care services and impacting the success of home care franchise owners. You can tap into their knowledge and expertise to build a strong and thriving business in your home town. Click the Get Started button to receive more information regarding Visiting Angels elderly home care franchise opportunities.